If you want to know how to find density, keep reading. This article will provide you with density formula, which the calculator is based on, and you'll also learn how the density of water changes under different circumstances. Determine the weight of an object. For example, a glass of water weights 200 grams net (without the glass itself). Find out the volume of an object. In our example, it's 200 cm3. Or use our density calculator to make it a breeze! 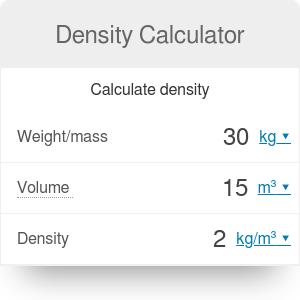 The fastest way to find the density of an object is of course to use our density calculator. To make the calculation, you'll need to know a few other values to start with. Make a note of the subject's weight and volume. After typing these values into the density calculator, it will give you the result in kilograms per cubic meter. Sometimes people are looking for the option to convert grams to cups - given density of the product and weight in grams, you can find the volume of the ingredient in cups. Allow us to throw in a bit of a curve ball here by reminding you that if you want to calculate the density of pixels on your screen this calculator won't do, but we purposefully made one called PPI calculator. For most purposes, it's enough to know that the density of water is 1000 kg/m3. However, as with almost all materials, its density changes with temperature. However, we have a slight, but a super important anomaly when it comes to water. While the general rule is that as temperature goes up, the density lowers, water behaves differently in the range between 0°C and 4°C. If you cool water from room temperature, it becomes increasingly dense. However, at approximately 4°C degrees, water reaches its maximum density. How's this important? It makes it much harder for lakes to freeze in the winter. Since the water at 4°C is the heaviest, it falls to the bottom of the lake. The colder water stays at the surface and turns to ice. This phenomenon, coupled with a low thermal conductivity of ice, helps the bottom of the lake stay unfrozen, so that fish can survive. There are also other aspects which affects water's density. It changes slightly whether it is tap, fresh or salt water. Everything inside a body of water affects its density. Density Calculator can be embedded on your website to enrich the content you wrote and make it easier for your visitors to understand your message.